The Juris Doctor degree , also known as the Doctor of Jurisprudence degree , is a graduate-entry professional degree in law and one of several Doctor of Law degrees. It is earned by completing law school in the United States, Canada, Australia, and some other common law countries. It is regarded as a bachelor's degree in Canada, a master's degree in Australia and a professional doctorate in the United States. The Juris Doctor degree (J.D. or JD), also known as the Doctor of Jurisprudence degree (D.Jur. 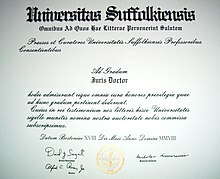 or DJur), is a graduate-entry professional degree in law and one of several Doctor of Law degrees. It is earned by completing law school in the United States, Canada, Australia, and some other common law countries. It is regarded as a bachelor's degree in Canada, a master's degree in Australia and a professional doctorate in the United States. The degree was first awarded in the United States in the early 20th century and was created as a modern version of the old European doctor of law degree (such as the Dottore in Giurisprudenza in Italy and the Juris Utriusque Doctor in Germany and central Europe). Originating from the 19th century Harvard movement for the scientific study of law, it is a degree that in most common law jurisdictions is the primary professional preparation for lawyers. It involves a three-year program in most jurisdictions. To be authorized to practice law in the courts of a given state in the United States, the majority of individuals holding a J.D. degree must pass a bar examination. The state of Wisconsin, however, permits the graduates of its two law schools to practice law in that state, and in its state courts, without having to take its bar exam - a practice called "diploma privilege" - provided they complete the courses needed to satisfy the diploma privilege requirements. In the United States, passing an additional bar exam is not required of lawyers authorized to practice in at least one state to practice in the national courts of the United States, courts commonly known as "federal courts". Lawyers must, however, be admitted to the bar of the federal court before they are authorized to practice in that court. Admission to the bar of a federal district court includes admission to the bar of the related bankruptcy court.